Johnny was a new addition to Joe’s team having arrived from the U.K. in Dec 2015 after a successful year at preliminary level with New Zealand rider Lizzie Brown. 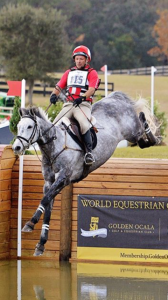 Joe is very excited about the very scopey and talented young horse and they finished double clear around their first CIC* together at Red Hills in March 2016. Johnny has gone to jump double clear around his first CCI* in Ocala International and had a fantastic first CIC** at Jersey Fresh. Johnny is now competing at Advanced with 4 clear rounds and excellent placings and jumped clear at Bomont CCI***. He is truly an exceptional star of the future. Johnny is currently UNDER SYNDICATION and we are looking for syndicate members to join ahead of Johnny’s debut at 4 star at Land Rover Kentucky CCI**** this spring..